We’re back again from our winter buying trip, and we have lots of new treasures! There is Amazez™, a powerful new addition to the Azeztulite family, as well as Angeline Stone™, a powerful combination of Amethyst, Cacoxenite, Goethite and other minerals. We’ve also come up with a new collection of Power Strand necklaces we are calling the IAM Collection™. These pieces are among the most synergistic energy combinations we’ve ever put together! And speaking of powerful combinations, this catalog introduces our 2021 Limited Edition Bracelets™, made to facilitate one’s attunement to the Ascension Year of 2021. 2021: Year of Ascension - What Comes after 2012? “If this vision is true, and if we can enter through our meditative crystal work into conscious communion with the being known as Sophia, (the ancient Greek name for Wisdom), we will change, and we will feel unimaginably expanded beyond all we have been and known. This is the transformation I am calling Vibrational Ascension. To many of us, it feels as if we have been preparing for this change for a long time, and for me it seems that the 11:11 opening has stepped up the process considerably. My intuition is that the intensity of this energy of awakening will increase through all of 2012. After we have passed through the 2012 Solstice gateway, I sense that there will be a period of about nine years of GRACE, within which our access to spiritual experiences and communion with the World Soul will be greatly enhanced. Whatever is going on in the outer world, whether wonderful or horrendous, the spiritual realms will be right beside us, more present than at any time we have experienced. It is important for us to attend to the Grace, and to surrender into it. As always, our mineral allies will be there to help us. “As I worked on the 2021 Bracelets, I kept seeing inner flashes of complex and powerful stone combinations that could only come together in necklaces. 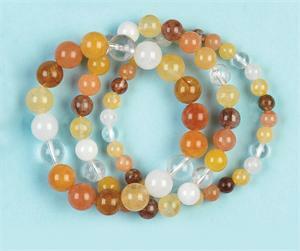 I immediately realized I wanted to include new stones in these Power Strands––stones such as the sweet Sauralite Azeztulite from New Zealand, blissful Anandalite from India, purifying Auralite 23, the protective and empowering Guardianite and the amazingly strong new kind of Azeztulite called Amazez. As I was working on the initial combinations, I heard inwardly the words, ‘You must BECOME what you seek.’ Next I heard, ‘Use the power of IAM.’ I suddenly understood that these were to be called the IAM Power Strands, and that each necklace is to carry the program that the one wearing it will fully embody the intention of the piece. I urge each person who chooses an IAM Power Strand to claim its potential with the phrase IAM. When you put it on for the first time (and maybe even every time) say aloud: ‘IAM ...’ followed by the name/purpose of the necklace. This will program both the stones and yourself to co-creatively bring this into being. Upon request, I will also gladly program each necklace with my intention for the highest good of the recipient. After all, we are all co-creating the Planetary Vibrational Ascension together! “Actually, I would urge this same practice of the invocation of the IAM for those who buy the 2021 Bracelets, or any of our other Power Strands. It is a potent mode of co-creative activity, and the Soul of the World is waiting for us to co-create with Her. On our winter buying trip, we came upon an interesting stone from a location off the African coast. It appeared to be a banded mixture of white Quartz and purple Amethyst, with v-shaped patterning. When we checked the energies, we were amazed to recognize that it vibrated in the frequencies of Azeztulite! This discovery confirmed what the Azez––the guardian angelic group soul responsible for all the Azeztulites––had foretold. Continent-by-continent, the energies of the Nameless Light are penetrating and activating more and more varieties of Quartz in an increasing number of locations. This process, and all the energies moving toward Planetary Vibrational Ascension, appears to have been accelerated, just as the Azez foretold. This new material was the second incidence in which an Amethyst Azeztulite had been found! (The first was last year’s discovery of a small amount of Amethyst-bearing Sauralite Azeztulite from New Zealand.) We decided to call this new Amethyst-Azeztulite by the name Amazez, and have just begun to explore its properties. We continue to be awed by the unfolding of the saga of Azeztulite and its connection to the Earth’s awakening. Robert Simmons writes: “When I first saw the crystals we call Amazez, I was struck by how beautiful they were, and how much they physically resembled Auralite 23. I thought to myself that the stones of the Purple Ray are really stepping forward to center stage! However, unlike Auralite 23, these new stones are not all purple Amethyst––they contain bands of white as well. When I first felt their currents, I realized they had a much stronger vibration than I had expected––stronger than any Amethyst-bearing stone I had ever come across. (One of the workers in our studio called it a ‘freight train,’ because that’s how hard it hit her...but in a good way!) And although Amazez emanates very powerful currents, it is clear that they are of the high-vibrational nature that is the signature of Azeztulite. 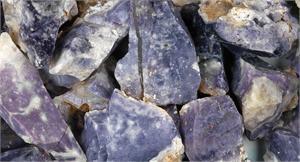 “It is very exciting to see the Azeztulite frequencies expanding into stones in the Amethyst family, and very helpful. Amethyst has long been known as a stone of Divine Connection, and a stone of spiritual protection and purification. It is one of the oldest healing stones, and is perhaps the most popular crystal in the world. As the currents of the Nameless Light continue to spread through the stones of the Earth, more crystals are awakened and activated to the Azeztulite vibration. In Amazez, we have the best possible combination of Azeztulite’s spiritual Light with the traditional beneficial energies of Amethyst. “When I held a piece of Amazez in meditation, I tried it on various chakra points. The first thing I noticed was that it can stimulate and bring Light to any chakra, or to any part of one’s subtle energy body. Although Amethyst’s natural ‘home’ is at the third eye and crown chakras, Amazez was equally able to activate the throat, heart, solar plexus, and even the first and second chakras. It fills the whole body with powerful currents of blessing and purification, and it is easily grounded through the feet. In fact, I sensed that a major part of this stone’s program is to ground spiritual Light into the Earth through us––a purpose completely in alignment with all the other Azeztulites. “Amazez harmonizes with all of the Azeztulites, as well as Auralite 23, Angeline Stone, Elestial Angel Calcite, Violet Flame Opal, Phenacite, Danburite, Scolecite, Brookite, Natrolite, Merkabite Calcite and Nirvana Quartz. It has a special affinity for Guardianite, and together they emanate a hugely powerful vibration of protection, purification and empowerment. There were dozens of similar comments and many magical moments within which people holding the Sauralite Azeztulites experienced spiritual connections that were both profound and sweet. There is a deep and unique current of felicity––of peaceful joy––coming through these stones. It is both Angelic and Earthly, and it makes one feel as if one is in the presence of a great Being, who is intimately and lovingly aware of oneself, and in whom one can completely trust. Sauralites are strongly connected with Nature, and with the particular gentle and friendly aspects of Nature that one finds in New Zealand. They speak of a spiritual Earth that is youthful, happy, generous, healthy and full of magic. This is not the Earth of the past, but of the future, and Sauralite’s currents are an invitation to co-create that world through participation in its qualities. Of all the stones I love (and there are many!) Sauralite is the stone I most delight in introducing to people. It is so much fun to watch their faces as the stones’ energies begin to pour into them! First the eyes display the recognition that energy is flowing, then there’s a smile as they feel the stone’s friendliness. Next there often comes a flush of emotion or a murmur of ‘Wow!’ as the person senses the currents circulating more and more deeply within the body, bringing Light and joy throughout. This sort of thing happened many times at the Tucson show, and last September at the Denver show, as well as in our Vermont studio. These stones kindle a feeling of delight and love in a way that is unique, even among Azeztulites. Since my last article about Sauralite Azeztulite, I have worked with them more and feel some new insights arising. I view Sauralites as the stones carrying the vibration of the Divine Feminine in her new manifestation as the consciousness and joy of the illumined Earth. Sauralite tells me that the Garden of Eden is not in the past, but in the future, and that this future is approaching rapidly, even in the face of all the environmental degradation we see in the daily news. The Earth is arising to meet the Light of the Great Central Sun, and in this merging will come the healing and the joy for which all our hearts are longing. When we work with Sauralite Azeztulite, allowing that energy to permeate us, it is as if one cell in the body of the Earth has turned on its inner Light. As more of us do so, more Light is kindled in Her body, and the cascade of Light which is Her full awakening is kindled. All of the Azeztulites, as well as many other stones, are serving this purpose, but in Sauralite, the gentle, playful, loving Light is most accessible. 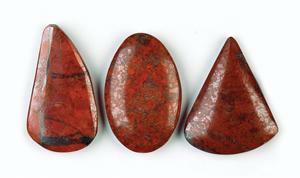 In self-healing work, I recommend Sauralite Azeztulites for issues around depression or grief. These stones can also be used to help dispel stress and inner tension, and to relieve negative obsessions about things which have happened in the past. They can aid in clearing past-life negative fixations which are impairing emotional or physical well-being. In meditation, Sauralites can put one in touch with the co-creative edge of the World-coming-to-be, the flowing stream of eternity entering into time. These stones can guide one into the state of heart-sovereignty, in which one’s consciousness is heart-centered and the mind defers to and serves the heart’s wisdom. Sauralite Azeztulites also stimulate the imagination, trigger inspiration and encourage living in the world within a state of constant blessing. They are at the leading edge of the New Consciousness, and they can provide us with both a vision of the New Earth and the experience of how we can enter it, while simultaneously helping bring it to birth. I hope that all our readers will claim a piece of this wonderful new stone, and to make that easier, we have decided to offer lower prices on many pieces of Sauralite Azeztulite. Also, we have cut and tumbled some of the pieces to make wire wrapped pendants and small, less expensive pocket stones. To me, it is highly important that these stones get into the hands of as many rock-lovers and practitioners of crystal healing as possible. I feel this so strongly that we are making another trip to New Zealand to bring back more of them, if we can find them. When readers receive this catalog, that’s where we will be. In the meantime, I hope your experiences with Sauralite Azeztulite will be as joyful and illuminating as ours! “When I held a piece of Purple Angeline, I was immediately impressed by the quality of its currents. It stimulates both the third eye and crown chakras, in a rhythm that I had never felt before. For me, there was a double-pulsing sensation, in which energy from above the head was ‘gathered’ and pulled, first into the crown chakra and then to the third eye. And by the time the pulse reached the third eye, another one was gathering above the crown. My felt sense was that this stone is providing a kind of energetic ‘funnel’ via which spiritual energies can be channeled in from higher realms. “I was quite amazed, to say the least, to have gone into meditation with this new stone and to have inwardly met it as a being! This has happened to me before, but rarely so vividly. My sense from the experience is that Purple Angeline is recently activated, perhaps only with the last few months, and that its intelligence is quite eager to get on with its work among humans. The stone itself has a very lively energy, and if one simply wears or carries it, there will be a freshness in one’s demeanor, and a bounce in one’s step. When one meditates with it, one is likely to experience the pouring in of ‘liquid blessings’ through the crown. This is significant, and has to do, I feel, with the activation of one’s awareness of one’s true purpose and destiny. It is not so much that we will see our destiny as a concept that could be summed up in a sentence, but that we will see the steps on our right path, just before it is time to take them. And we will know they are the right steps. “Purple Angeline is also a healing crystal. It can be utilized for spiritual healing in issues having to do with patterns of dysfunction rooted in childhood or past lives. Also, if there are problems with invading entities or holes in the auric field allowing for energy drains, Purple Angeline can be very helpful. “As it clears dysfunctions and seals the aura, Purple Angeline also sets free our power. It stimulates the latent creative energies of the second and third chakras, and can catalyze both inspiration and manifestation. For artist or writers who are ‘stuck,’ or for anyone who is not living one’s full potential, Purple Angeline is an ideal stone companion. At our showroom at the recent Tucson Gem and Mineral shows, one of the big hits was Auralite 23. There was a big “buzz” around the show about this new and powerful crystal, and buyers snapped up most of our supplies. However, we have recently received a new shipment, including some polished crystal wands and a number of large Auralite 23 Generators. We’ve also started making smaller tumbled Auralite 23 pieces, as well as wire wrap pendants. We want everyone to have access to the energies of these powerful new stones! Robert Simmons writes: “The appearance of Auralite 23 marks an initiatory moment for the Violet Ray of spiritual Light on the Earth plane. As we move through the multiple vibratory gateways of 2012, much purification is needed, as well as protection and an enhanced Divine connection. 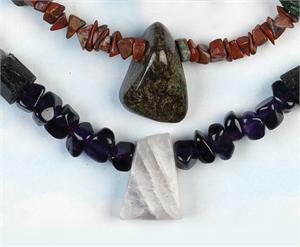 Thus, new stones of the Purple Ray have suddenly emerged, including Auralite 23, Sauralite Azeztulite with Amethyst, Violet Flame Opal and the powerful new Amazez. Auralite 23 and all of these other stones facilitate the energies of purification, protection and one’s link with the Divine. In addition, Auralite 23 stimulates higher awareness and telepathic connection with one’s guides and guardian spirits. It offers a direct and immediate link to what is called the “Magic Presence” in esoteric literature––the Self beyond the everyday “I” that knows one’s life pattern and destiny, and which can help one live one’s life as an expression of one’s true spiritual purpose. 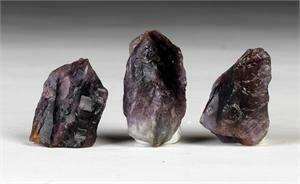 “The link Auralite provides to higher realms can instigate a process of inner purification. Those willing to receive this stone’s blessings are inwardly ‘inspected’ and cleansed of various inner knots of negative fixation. The felt sense of this can seem like a dissolving of one’s cares and worries––a release of patterns of anxiety, resentment, judgement, depression and defeat. As this dissolution occurs, one feels an upliftment of one’s spirit and an awakening to the potentialities for a new life. This rising of optimism and new hope is felt all the way into one’s cellular consciousness. “Other effects of Auralite 23 can include an increase of one’s psychic sensitivity, enhanced insight into truth, disappearance of chronic problems with the body, a balanced awakening of kundalini, an awareness of the ‘eternal now,’ spontaneous visions of future events, enhanced capacity for soul travel and lucid dreaming, and experiences with Angels. 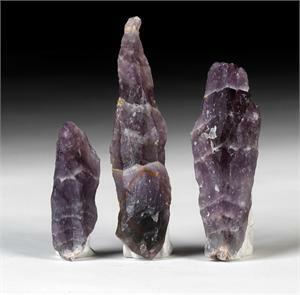 “As a stone of the Divine Blueprint, Auralite 23 makes an excellent stone tool for spiritual healing. It can be applied to any area of the body in order to rebalance and heal through the re-installation of one’s Pattern of Perfection. 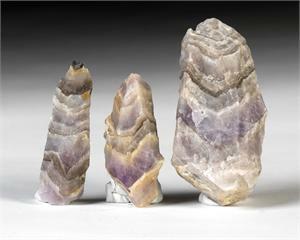 Auralite 23 reminds the body, on a cellular level, of its proper vital function. As such, this is a stone of regeneration and rejuvenation. On the emotional level, the peace and widened awareness facilitated by Auralite 23 can clear many triggers and snags that cripple the emotional body. This stone also helps heal the soul through facilitating remembrance of past lives and stimulating the insight needed to release karmic patterns. When we were at the Tucson Gems and Mineral Show, we met a man who had discovered some very interesting stones. He lived near the fabled energy vortexes in Sedona, Arizona, and had found them in a remote area at one of the vortex locations. 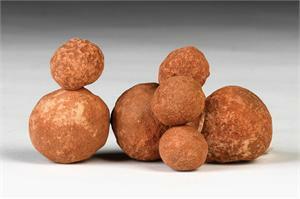 They are little reddish-brown balls, the same color as the red rocks Sedona is famous for. From their appearance, we were tempted to name them Vortex Eggs, and when we felt how energetic they are, we half expected one of them to hatch! But we finally chose the name Sedonalite, which means both Stone of Sedona and Sedona’s Light. We hope our readers will agree that the name is well chosen. Robert Simmons writes: “Sedonalites are sandstone concretions that formed near the Sedona energy vortexes. They contain a high percentage of Quartz, and are thus able to receive, retain and transmit much of the energy to which they have been exposed. Since they were found in such a highly charged area, Sedonalites are extraordinarily active stones! 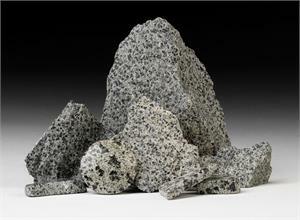 “Sedonalite is a stone of dynamic energetic balance. It can both charge and harmonize the meridian system, and it can bring one’s astral and subtle bodies into resonant alignment with the physical. The stones are both grounding and stimulating, engendering a heightened sense of sensitivity and alertness. They are like two cups of coffee, in the best sense––recharging the nervous system, enhancing thought and verbalization, but without causing tension or irritability, as caffeine can do. These stones wake you up, but they don’t drag you down! They can be used to activate any of the chakras, as well as the meridians. “I have a collection of Phenacite crystals, because they emanate some of my favorite energies. They are probably the strongest stones for stimulating the third eye, and for enhancing interdimensional travel and visionary experience. After feeling this new batch of crystals, I have a deeper appreciation for Colorado Phenacites. Energetically, these are the equal of any I have found. Their bigger size enhances their power and makes then easier to use for meditation or body layouts. 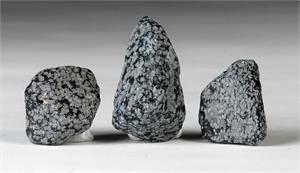 “These new Colorado Phenacites are powerful interdimensional travel stones. They can immediately open the third eye and guide one’s point of awareness into a cascading kaleidoscope of dimensional gates and corridors. They are good for time travel, and can help one in past life regression work or even future life visionary experience. “These Colorado Phenacites also stimulate the crown chakra, and can facilitate the opening of the ‘thousand-petaled lotus.’ They allow conscious access to the Soul Star chakra above the head, and can be an aid to climbing the ‘Jacob’s Ladder’ of multiple spiritual dimensions. 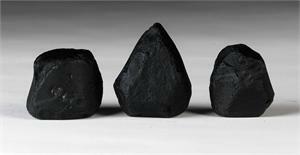 For more than twenty years, we had been on the lookout for good quality pieces of raw Black Obsidian. There were plenty of polished items on the market, but all the raw pieces we found were too big and too sharp-edged for our needs. Finally, on this year’s winter buying trip, we met a mineral collector who had found and gathered a good supply of one-inch to four-inch chunks of what he called Midnight Black Obsidian. (Their color made the name make sense––they are utterly black!) These pieces were exactly what we had been looking for, with natural surfaces that were comfortable to hold, and not broken off a larger chunk. When we check into them energetically, they fit our wishes there as well. Robert Simmons writes: “Black Obsidian is an important stone––one of the best for protection, cleansing grounding and purification––and these are by far the finest raw specimens I have seen. They have great color, shape and texture, and they are the right size range for meditation, pockets stones or body layouts. The larger ones are perfect for placing around the house for protection and keeping the energies of one’s environment clean and clear. “Midnight Black Obsidian powerfully eliminates negative energies in oneself and one’s environment. It is like a ‘psychic vacuum cleaner,’ cleansing the auric field of greed, fear, resentment, etc. It is a strong grounding stone, stimulating the root chakra to make its connection with the Earthstar chakra below the feet, and deep into the core of the Earth. “Midnight Black Obsidian provides a powerful energy of protection. As my co-author Naisha Ahsian has written, its frequency seals the aura and removes energetic attachments, cords and hooks. Midnight Black Obsidian’s energy creates a protective shield that helps one stay centered when dealing with all sorts of negativity. “Like other Obsidians, Midnight Black Obsidian is useful for all types of scrying, including spirit communication. If one sets up a low-light environment and sits gazing into the blackness of one of the larger pieces, (or into a polished Black Obsidian slab or sphere), it is quite possible that the images of loved ones who have passed over will appear in the dark surface. At the same time, one may feel their messages as thoughts appearing in one’s own mind. Midnight Black Obsidian’s affinity for the world of the souls, plus its protective qualities, make it ideal for such activities. In these times of spiritual transformation, the cocooning soul needs to be shielded from negative influences, and we notice that the stones of Divine protection continue to make themselves available. Days after we returned home with our cargo of Midnight Black Obsidian, we received a supply of raw pieces of Snowflake Obsidian. This is another stone we had not previously been able to acquire in raw form, and it reinforces the beneficial energies of other protection stones. Robert Simmons writes: “Snowflake Obsidian enables one to ‘make the best of a bad situation’ by clearing negative and self-defeating thoughts and inspiring one with new ideas that can improve one’s condition, whatever it may be. Snowflake Obsidian grounds one’s thinking, eliminating energy-draining fantasy. At the same time, it increases one’s psychic sensitivity, making one more able to notice the meaningful synchronicities that can point the way to one’s higher path. Although it is not the best stone for gazing, meditating with Snowflake Obsidian can put one in touch with the world of souls, facilitating communication with lost loved ones. It also attunes one to memories of past lives or to forgotten events of the present life, focusing in both cases on the recall of events that relate to present difficulties. In such recall lies the key to the insights that will allow one to overcome and release the problems. Snowflake Obsidian is an able assistant in one’s inner journey to healing and wholeness. We have long offered fine Madagascar Celestite clusters, but our latest buying trip yielded a wonderful and beautiful batch of rare and beautiful natural single crystal points of Madagascar Celestite. We were so impressed by these crystals that we photographed all the A++ pieces, which are shown on pgs 42 to 43 of this catalog, and on our website. (You can also see samples of A+ grade pieces on page 54) Healers and anyone who works with stones for body layouts or in meditative practice will love these Celestites. They provide a powerful and well-focused source of Celestite energy, and are ideal for carrying in a pouch, to keep the good vibes with you all the time! Robert Simmons writes: “Celestite offers a gentle, uplifting energy which can raise and expand one’s awareness into the higher realms. It is one of the most effective stones for accessing the angelic realm and can facilitate communication between oneself and one’s guardian angels or angelic guides. It stimulates the third-eye and crown chakras and the etheric chakras above the head. 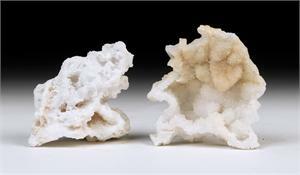 It is a soft stone both physically and energetically. As it elevates one’s awareness, Celestite makes one feel as if one is floating on a cloud rather than zooming in a rocket. One of the thrills of our buying trip was our purchase of a large batch of fine clear Apophyllite natural crystalline Pyramids from India. These rare formations have long been a favorite for all sorts of inner work, including interdimensional travel. The natural crystal Pyramid form is a great energy-focuser, and they have always been highly popular, whenever we’ve had them. Robert Simmons writes: “Clear Apophyllites excel at attuning one to the higher-frequency energies of the angelic and interdimensional domains. Indeed, these crystals can serve as windows into many other worlds, and those wishing to experience interdimensional travel will enjoy working with them. The Pyramid form is the ideal choice for such work. Meditation is one of the chief ways of working with Clear Apophyllites. I especially suggest focusing upon ‘entering’ the stone. If one can imagine one’s point of awareness moving into the interior of one of the Clear Apophyllite crystals, one will find, once ‘inside,’ that geometric corridors of Light lead off in all directions, and that one’s consciousness can travel along these corridors to myriad realms of inner experience. Keeping one or more of the Clear Apophyllites in one’s environment can provide an atmosphere of purity and spiritual presence in one’s home, meditation area or work space. Placing one of these crystals on a table or shelf in each of the four directions, with a fifth one at the center, creates a powerful geometric energy grid which will clear and purify the vibrations of an entire room. “Angels are attracted to the Light and high vibrations emanated by Clear Apophyllites. One may use these stones to contact one’s guardian angels and spirit guides, or to visit the higher angelic realms. They are also useful tools for developing prophetic vision. The ideal chakra placements for Clear Apophyllites are the third eye for prophecy and interdimensional travel, the crown chakra for connection with the angelic domain, and the heart chakra for awakening awareness of Divine love. “Clear Apophyllite Pyramids have a resonance with ancient knowledge, and can by used for traveling interdimensonally to the akashic Hall of Records, in order to retrieve this knowledge. The Pyramids are also much easier to ‘enter’ psychically than are the more complex clusters, and it is easier to work with the energy portals in these crystals than it is with other forms of clear Apophyllite. “Clear Apophyllite Pyramids are ideal for meditation and body layouts, and they are good for carrying in pouches, to keep the interdimensional connection active throughout the day. These crystals are excellent for making conscious contact with one’s Angelic guides and protectors, and they help one to be more sensitive to all sorts of communication from the higher realms. Another stone of Angelic connection and communication is Elestial Angel Calcite (aka Elestial Calcite and/or “White Moldavite”). Although the only thing these crystals have physically in common with true Moldavite is their wrinkly outer texture, their high vibrations make them a naturally harmonious companion for Moldavite, Azeztulite and most other high-vibration stones. Robert Simmons writes: “These are among the most high-vibration, high-intensity Calcite crystals I have ever experienced. They feel in many ways more like Phenacite or Azeztulite than other Calcites. With the amount of power they emanate, one can understand how they acquired the nickname ‘White Moldavite’. “When one holds two pieces of Elestial Angel Calcite, one at the third eye and one over the heart chakra, one experiences the formation of a flowing energetic circuit, enhancing the communication between heart and mind. This energy moves in a continuous loop, which builds an ever-increasing bond between the mental and emotional bodies. “Using Elestial Angel Calcite at the third eye, or using two pieces, one at each temple, creates an activation of the prefrontal lobes, the most advanced parts of the brain, which we have not yet learned to utilize fully. This can be experienced at first as a rhythmic pulsation in the head, but over time this can facilitate deeper activation, which can initiate new or more sensitive paranormal abilities. “The activation of this area facilitates the activation of many of our latent capacities, one of which is Angelic communication. These stone have a natural affinity with the high, fine vibrations of the Angelic realms, and the open us to experiencing them. These stones stimulate one’s ability to hear the ‘music of the spheres’––the astonishing harmonies of the ‘singing’ of angelic beings in the higher dimensions. Elestial Angel Calcites also awaken our inner vision to see in these domains, and to interact with the beings who exist on that level. “Elestial Angel Calcites are natural inner gateway stones, opening conscious access to the ‘psychoid’ realm––the inner space where the spiritual and physical worlds overlap. This is the realm of shamanic journeys, encounters with spirit guides, extraterrestrials, devas and other spiritual beings such as the Archetypes. For those who like exploring the inner worlds, and who wish to understand their effects on this world, Elestial Angel Calcites are a wonderful helper. “Elestial Angel Calcites are stones of interdimensional connection, assisting one in receiving inner guidance and enabling one to tune in to realms of the highest spiritual Light. To increase the interdimensional opening provided by Elestial Calcite, combine it with Moldavite, Phenacite, Herderite and/or any variety of Azeztulite. “For communing with entities of the Angelic realm, I recommend using Elestial Angel Calcites in conjunction with Clear Apophyllite Pyramids and also Celestite. 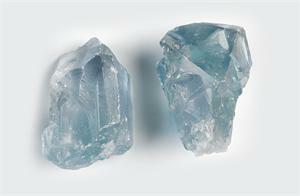 (The recently found Madagascar Celestite points are ideal.) 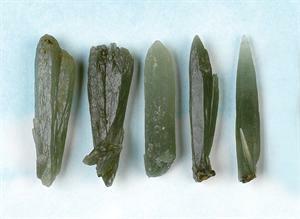 For the strongest possible connection with the devic realms, combine Elestial Angel Calcites with Green Apophyllite and/or Seriphos Green Quartz. For enhanced activation of one’s evolutionary unfoldment, add Herderite to the mix. Among the most eye-catching finds on our winter buying trip is a new stone from Africa, Spiderweb Cuprite-Chrysocolla. This is the most beautiful combination of Cuprite and Chrysocolla we have ever seen, displaying intricate patterns of blue on a red-black background. The red-black is a rich, pure form of Cuprite and the blue is fine Chrysocolla. We bought all of these lovely tumbled pieces that were available, and are pleased to offer them. Robert Simmons writes: “Spiderweb Cuprite-Chrysocolla is a stone of pure feminine power. It embodies both the gentle and strong sides of the feminine, and it engenders their empowerment in those who work with or carry these stones. 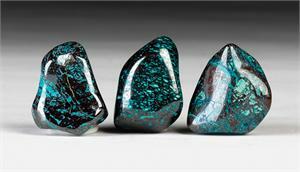 Spiderweb Cuprite-Chrysocolla stimulates the life-giving portal of the root chakra, bringing in copious amounts of . It also activates the throat chakra, helping one give powerful and eloquent voice to the truth of one’s inner feelings. This is a stone of the Goddess, and it has the capacity to awakening one’s connection to Her. It allows one to recognize oneself as a child of the Goddess, an embodiment of Her, and to act accordingly. For those whose tasks in life include nurturing others, it brings a fresh supply of energy. For those who wish for more meaningful relationships, it stimulates the energies that attract such relationships. For those who wish to give birth, whether to children or creative works, it initiates and maintains a strong flow of fertility. “In spiritual self healing, Spiderweb Cuprite-Chrysocolla lends its energies to the wellbeing of the female organs, and it works to heal the emotional body. It can be used by those who feel soul-loss around their femininity, or who have been emotionally abused. This stone reminds one that the Divine Feminine loves all of her daughters, regardless of the mishaps of life––and it helps women to reclaim their power through remembrance of their Goddess connection. “For men, Spiderweb Cuprite-Chrysocolla is especially useful for grounding ourselves in our bodies. Many of us are too much ‘in our heads,’ and this makes if difficult for us to develop intimacy with others. The particular sort of grounding offered through Spiderweb Cuprite-Chrysocolla puts us in touch with the Earth and with our own bodies in a very intimate fashion, and this frees us from being stuck in the mental. “Spiderweb Cuprite-Chrysocolla is a powerful shamanic stone, making it possible for one to journey safely to the Lower World, and to meet one’s power animals and spirit guides in that realm. It can take one deeply enough, on occasion, to glimpse, and even meet, the Soul of the Earth. Robert Simmons writes: “Crimson Cuprite is a profoundly helpful stone for those working on healing issues, irrational anxieties, or fears around one’s mortality. It offers pure first-chakra energy, and its abundant flow of is a boon to anyone whose first chakra is closed or weak. Meditation with Crimson may be instrumental in awakening the kundalini energies. As a stone of , it offers vibrational support for healing lung dysfunctions, circulation difficulties, prostate or lower-bowel issues or problems with the sexual organs. Crimson Cuprite is a stone of feminine power, and it activates the feminine archetype of the Earth goddess. Women who wish to find their own connection to Her are advised to wear, sleep or meditate with it, and to imagine their own base chakra with a red root extending deep into the Earth. Crimson Cuprite can also be a stone of alchemy, and it resonates with the archetypes of the Magician and the High Priestess. Just as copper conducts electricity, Crimson Cuprite carries divine energies from the inner world to their manifestation in the outer world. One of the most interesting items we found on our buying trip was a stock of small, slender Quartz crystals from Madagascar. They range from 1/2 inch to 1 1/2 inch in length, with varying shapes, though all are thin compared to their length. What is most interesting about them, however, is their energetic effect on other stones. Robert Simmons writes: “Magnifier Quartz got its make because it is a powerful enhancer of the energies of almost all other stones. It is a kind of vibrational turbo-charger that can be applied to amplified the effects of just about anything. This makes them invaluable for constructing crystal tools, and for stone grids and body layouts. They can be added to wands, carried in medicine bags, placed with stones in ones environment, put on healing altars, included in elixirs, or ant of hundreds of other applications where one wishes to increase the power of stones and/or one’s intention. Magnifier Quartz increase the power of one’s intent, as well as the vibratory intensity of other stones. “Magnifier Quartz is a catalyst for all sorts of synergies, and can be dispensed to members of groups who are working together, to enhance their cooperation and effectiveness, and to inspire creative visions. I even suggest placing the stones in one’s cabinets and refrigerator, to enhance the life force and the energetic nutritional value of foods. Taping them one’s vitamin bottles is another way to reap their benefits by stimulating the vibrational patterns of the vitamins. Affixing them to one’s water bottles is a way of empowering and programming the water one drinks to be of maximum benefit. Putting them inside a hat or headband can be done to increase the quality of one’s mental processes. There is literally no end to the possibilities of life enhancement for which one can utilize Magnifier Quartz. And the stones themselves are inexpensive, so one can use them rather lavishly. 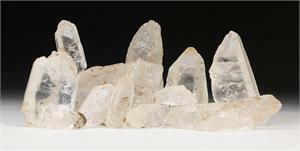 Robert Simmons: “Faden Quartz is one of the premier healing stones of the Quartz family. Perhaps because the stones themselves were ‘injured’ (broken and re-healed) during their growth process, they carry the pattern of healing very strongly within their natural programming. Thus, when one moves into resonance with one of these crystals, one’s own capacity for healing is activated and/or reinforced. “Faden Quartz crystals are highly programmable, making it possible to increase their potency as healing stones. Working with focused intention, one may ‘install’ programs for different crystals to work on different maladies. With enough Fadens, a practitioner can build a set of crystal tools suitable for almost any vibrational healing application. One advantage of using Fadens, in addition to their natural orientation towards healing, is that they retain their programming for long periods of time without needing to be recharged. In fact, if one wishes to change the programming of a Faden Quartz crystal, it must first be cleared of old programs. Burial in the ground for one week is recommended, but an overnight saltwater bath will also suffice for most purposes. “Most users will find these stones to be of a singularly high energy, ideal for consciousness expansion and accessing any of the higher vibrational planes. They are also well suited for those who wish to attune to the inner movements of the Earth. The Fadens’ experience of past earth changes makes them ideal tools for those who seek information on current and future physical and vibrational shifts of the Earth. These crystals can also be programmed to provide protection from physical disruption, both for individuals and for places. For areas, it is best to position at least four crystals at the borders, pointing in the four directions. 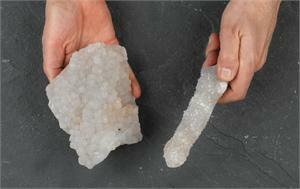 For individuals, carrying or wearing a Faden Quartz can be most beneficial. One can program a single crystal for multiple uses, such as protection, accessing one or more of the higher planes, chakra activation, etc. Among the most immediately popular stones we have ever brought into this catalog are Z Stones. These quirky concretions from the Sahara desert caught on like wildfire, and we sold out of our first two batches very quickly. Now we are pleased to announce that we have acquired a new collection of them––which was quite a trick, amid the political tensions in northern Africa––and it is even bigger and better than our first batch! Robert Simmons writes: “For those who wish to travel interdimensionally and explore the subtle realms of consciousness, Z Stones could provide an interesting ticket. They powerfully stimulate the third eye and crown chakras, although they do not immediately take one ‘up’ to the angelic realms. Instead, it is as though the Z Stones widen one’s awareness, allowing one to see and explore the nearer realms which are normally overlooked in our everyday state. The astral realm can be readily accessed with Z Stones. Another more rarified realm, that of the ‘living geometries’ can be reached by using Z Stones along with meditative focus on the Merkaba or other forms of Sacred Geometry. “At the mention of the Merkaba, I am reminded of the type of interdimensional travel that utilizes the ‘Merkaba Vehicle of Light.’ This is visualized as two counter-rotating tetrahedrons, extending above, through and below the body, with one’s heart at the center. If one works to visualize this energetic vehicle while holding a Z Stone at the third eye, one may experience a much quicker and more vivid transition to the ‘traveling’ state. With this vehicle, one can potentially move, as a point of consciousness, anywhere in the universe, almost instantaneously. Such travel may be the most dramatic utilization of the currents available through Z Stones. “Z Stones can be helpful for those wishing to work with elemental energies. They can be excellent tools for working magically, especially in the area of sympathetic magic. When one works with Z Stone to focus awareness and will, the connection between the subject and the magical talisman is readily made. Guardianite was one of the biggest hits in our display of stones at the Tucson Show. Everyone who picked up one of these stones and tuned in to it was amazed at the power and intensity of its currents. At the same time, Guardianite was reported to be a very ‘comfortable’ stone, because the energies it awakened in people were so well harmonized that it was, in the words of one person, “like slipping on a glove––a glove that makes you stronger, but still yourself.” Another told us, “Guardianite makes me feel like I have eight beefy angels at my back, ready to help me handle whatever comes along.” A third said, “I sense myself being purified, cleared of tension and stress, and alert, ready for anything. It not only makes me feel clear and grounded, it makes me feel confident and powerful.” The sense of inner power was one of the recurring themes we heard from people who tried out Guardianite. Some people said the felt “safe,” others said “strong.” Still others mentioned words like “capable,” “effective,” “inspired,” “prepared,” “vigilant,” “fully embodied,” “calm,” “awakened,” “energized.” “protected,” “cheerful,” “joyful,” “full of myself,” and “good enough to fight dragons with a feather.” It was clear that these stones struck a welcome chord in our Tucson visitors. Robert Simmons writes: “Robert Simmons writes: “Guardianite is a new and powerful stone for the metaphysical community. 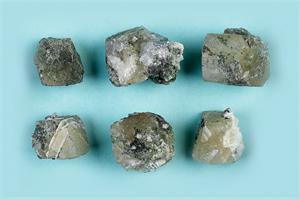 It is found in Oregon, USA, and is a complex stone, composed of the minerals aegirine, feldspar, nepheline, analcime, riebeckite-arfvedsonite, biotite, olivine and apatite. It exhibits intricate dotted patterns of black on a gray-white background. I was initially drawn to it because of its Aegirine component, which I liked because of Aegirine’s powerful energies of protection and purification. When I got the first samples, I discovered that the currents of the other minerals had combined with those of the Aegirine to produce a highly dynamic vibrational pattern that can permeate and strengthen one’s entire field. “The first sensation upon holding a piece of Guardianite is a deep and immediate grounding through the root chakra. This stone offers an almost instantaneous connection with the Earth and its upwelling Life Force currents––sometimes known as the Earth’s chi, or . As these currents move into one’s field through the enhanced connection provided via Guardianite, they flow throughout the Liquid Crystal Body Matrix––an experience felt as a humming vibration of well-being. This sensation is so nourishing, strengthening that one tends not to want to put the stone down! “My sense is that Guardianite can directly nourish the etheric and astral bodies, also enhancing their full integration with the physical self. The Aegirine and Riebeckite components give it a strong purifying and protective quality, while the Feldspar and Nepheline help one receive the nourishing Life Force energies of the Earth. The Biotite’s influence is one of grounding and strengthening. 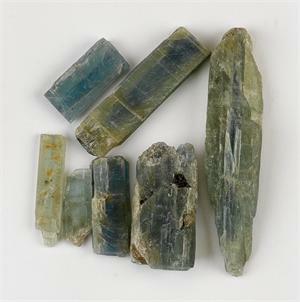 The Apatite aids in cleansing the auric field, soothing the emotional body, enhancing mental clarity and strengthening the will. The Olivine promotes one’s inner sense of well-being and instills a positive emotional attitude. Analcime’s currents provide an uplifting link to the higher vibrational realms. With so many beneficial minerals combined in a single stone, it is as if a team of angels has come together to provide the ideal combination of protective, purifying, balancing, strengthening and uplifting energies to aid human beings through the challenges of the very transitions we are facing now! “There is many uncertainties in today’s world, and we are all challenged to face them and handle them with equanimity. When Guardianite’s energies are in one’s field, one feels supported and empowered, safe from all harm. One’s center of Self is strong and stable, and one’s powers of will and manifestation are enhanced. One knows that one can overcome any obstacle and that one will always be protected. This sense of safety comes from a very real boost to the power of one’s energy fields. “Guardianite can repair damage to one’s subtle body and energy fields, allowing for the healing of many types of physical ailments brought about through energy-field damage. It can reseal a damaged aura, keeping one’s spiritual body protected from all types of negative influences, from fear to radiation. It is highly recommended as an aid for spiritually addressing unusual illnesses for which no immediate physical cause can be discovered. Its beneficial influence on the auric field can help heal energy leaks that lead to anxiety and depression. It is an excellent stone for breaking through all sorts of ‘downward spirals’ which can adversely affect one’s well being. It stimulates courage, confidence, optimism, creativity and willpower. It unleashes the dormant power of the fully awakened third chakra, allowing one to manifest one’s highest aspirations and make one’s dreams come true. “Guardianite is a stone of deep connection to the Earth, which accounts for many of its nourishing qualities. It helps those of us who like to hang out in the high vibrational realms to bring those powerful and dynamic energies into expression in the physical world. It links us to a source of unlimited power through alignment with the Earth’s chi, and it facilitates the connection through which we and the earth nourish one another in an unending love partnership. This full link with the Earth’s chi is a key to the regeneration and rejuvenation of the body, as the ancient Chinese alchemists knew and practiced. “Guardianite is an ideal partner for the high vibration stones which awaken the Light Body. It is a new member of the Ascension stones, providing strength and stability to the evolving and expanding Body of Light. It is an essential aid for those who work with any and all forms of Azeztulite, as well as Anandalite, Phenacite, Danburite, Herderite, Natrolite, Scolecite, Petalite, Brookite and Satya Mani Quartz. It has an astonishingly strong resonance with Sauralite, the newly discovered Azeztulite from New Zealand. It also resonates powerfully with the energies of Amazez and Purple Angeline. Robert Simmons writes: “Larimar is a stone of tremendous benefit to the throat chakra, providing the power of clear communication and the emotional strength and stability that enable one to speak from the heart. Larimar is a stone of feminine power, bringing in the goddess energies and allowing one to access the Divine Feminine within. It supports a state of confident well being and relaxed knowledge of one’s capacities. Relaxation is one of the benefits of Larimar. It soothes the emotional body, releasing undesirable attachments and relieving stress. Wearing the stone, one feels surrounded in an oasis of calm, always aware of the fundamental ‘all-rightness’ of the world, regardless of transient circumstances. 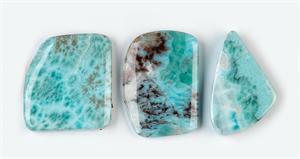 Larimar can cool hot tempers and guide excess passion into peace. It can be used to diminish the frequency and intensity of hot flashes and is a useful antidote when one’s kundalini energies have become uncomfortably active. “As a stone which connects one to the Goddess energies of Sea and Sky, Larimar helps women who wear or use it to awaken to the Divine Feminine within. It emanates vivaciousness and good humor, accompanied by confidence and a sense of one’s innate power. It helps women call upon the goddess within, in order to fully manifest their highest purpose in life. “In meditation, Larimar can help one see and release oneself from unhealthy inner bonds to other people, or to principles which do not serve one’s highest good. It opens the pathway to the ‘divine stair of ascension,’ upon which one leaves behind any obsolete past commitments. This year, at the beginning of our buying trip, we headed straight to our source of Seriphos Green Quartz. We can never seem to get enough pieces of this lovely crystal from the Greek island of Seriphos, but this year we were able to buy more than ever before. Our friend said that access to the digging site for this material is now restricted, so this may be our last good batch. In any case, we’re happy to be able to offer these! “Seriphos Green Quartz crystals emanate a most heavenly energy, and one can imagine the flower beds of the higher realms budding with just such as these. But the paradise of the Seriphos Green Quartz is right here on Earth! Holding, wearing, or laying-on these stones brings one into the awareness of Earth-as-Paradise. They emanate a sweet, strong vibration that evokes the state of wholesome enjoyment of physical life and facilitates the attainment of vibrant good health. Seriphos Green Quartz helps the user or wearer be grounded in the best possible way—through love for the material world and one’s place within it. It reminds us that we too are blooms brought forth from the womb of the fertile Earth, and our experience of life can be exquisite, when we bring our attention to its beauty and pleasure. These stones are helpful to those who feel uncomfortable in their bodies or are distressed at the hardships of life on Earth, helping them to recognize the Earth as Home. Blue Kyanite is an aluminum silicate mineral with a triclinic crystal system and a hardness varying from 4.5 to 7, depending on the axis. It occurs in Brazil, South Africa, Burma, Kenya Mexico and the USA. 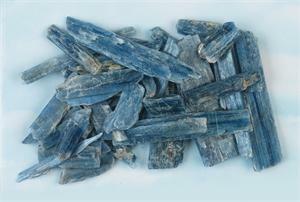 We were glad to find a source for high quality Blue Kyanite in a variety of sizes. Robert Simmons writes: “Blue Kyanites have a high vibration and create very rapid transfers of energy. They open the psychic channels and activate the mind centers, accentuating one’s mental capacities and enhancing one’s ability to ‘download’ information from higher sources. They can make telepathic communication between individuals easier, especially if both parties are using them. If one chooses to sleep with Blue Kyanite, the process of lucid dreaming will be greatly stimulated. “Blue Kyanite can link the physical, astral and causal bodies, catalyzing full consciousness in waking, dreaming and dreamless sleep. One must work at this, but it is well worth it when the goal is achieved. Green Kyanite is always “the hard Kyanite to get,” as it is much rarer than Blue Kyanite, and we felt lucky to get a good new supply on our buying trip. Robert Simmons writes: “Green Kyanites can create a bridge between oneself and the dynamic balance of Nature. It helps one to feel the ever-moving perfect flowing balance of the Tao, the life force of the Universe. “Green Kyanite connects one with the truth of the heart. It can aid in discerning truth in one’s environment, whether one is listening to the TV news or to a friend or family member. If someone is or is not speaking from their heart, one will know it. This stone also helps one live from the heart’s truth. This is very rewarding, because being in the heart’s truth means one is not looking outward for answers. Dream quartz is the metaphysical name given to Quartz crystals with Epidote inclusions. It is a silicon dioxide crystal with a hexagonal crystal system and a hardness of 7. Its color is a milky green. 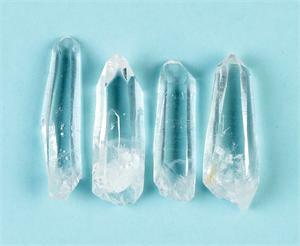 Dream Quartz comes from crystal mines in Colombia. It is a very difficult stone to find, especially in crystal form. It is usually simply in Quartz chunks. We were excited to get our hands on a small batch of nice Dream Quartz crystals from a friend in South America. Robert Simmons writes: “Dream Quartz emanates a soft, soothing energy, conducive to states of deep meditation and lucid dreaming. These stones can help bring peace to the heart and relaxation to the body and mind. It helps one enter the inner gateways to visionary experience and interdimensional travel. Dream Quartz can facilitate contact with spirit guides and can be an aid to the development of psychic abilities and channeling. Colombian Amber (sometimes called Copal) is a lovely golden material from the jungles of Colombia. It is believed by some to be a “young” Amber, though scientists are now beginning to find evidence that it may be millions of years old. 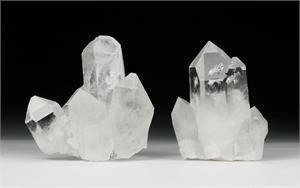 Regardless, its appearance and its healing energies make it desirable to the crystal community. This year’s buying trip yielded a very nice batch of Colombian amber polished pieces in sizes ideal for pocket stones, jewelry and body layouts, and the price is much lower than our Chiapas Amber from Mexico. Robert Simmons writes: “Amber is an organic material made up of fossilized natural botanic resins; it is a mixture of hydrocarbons with a hardness of 2 to 2.5. The word ‘Amber’ comes from ambar, the Arabic word for ambergris, a similarly colored material discharged from the sperm whale and used in making perfumes. Amber varies in color from yellow to brown or reddish brown, and is often transparent. “Many stones help us to connect with Light, but Amber brings us to Warmth. The energies of Amber are very solar, and they have the quality of creating a comfortable sense of warmth, health and well-being in the wearer. Amber is recommended to be worn or carried by anyone recovering from illness or injury, because its warm and nurturing energies put us in touch with our own essential strength and security. It is excellent for convalescence, because it warms the inner being and activates the life force, as well as one’s emotional desire for wellness. It helps one to see the path to recovery and have the courage and confidence to follow it. “Amber can also spur one’s innate capacity to manifest prosperity. 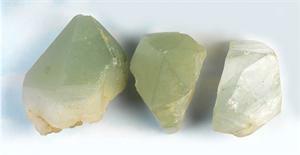 To amplify this potential, I recommend using it with prosperity stones such as Tsavorite, Yellow Sapphire and Moldavite. Pairing Amber with Moldavite is also helpful for bringing positive and successful inner transformation. In addition, Amber works especially well when combined with Jet, facilitating purification, health and protection from negativity. Anandalite is one of our most popular stones. Its quality of safely stimulating the kundalini energies has displayed itself every time we do a demonstration at a gem show or healing event. When people feel its powerful currents rising up from the root chakra––often first as heat or warmth, then as strong emotional energies of love and bliss, and ultimately as spiritual Light––they are always amazed and frequently motivated to take a pair of pieces home to work with them. We now offer Anandalite in polished shapes, beads, nugget strands and pendants, in addition to raw clusters and stalactites. All of these are quite popular, but we wanted to add something new. 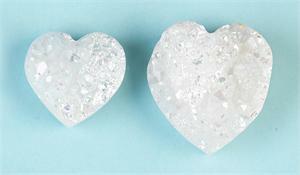 We finally decided to try coating some of our Anandalite heart shaped pieces with Angel Aura. Angel Aura is the name given to a specially applied coated made from powdered metal compounds, including platinum and silver. The alchemical transformation of stones coated with Angel Aura is often energetically profound, as well as aesthetically lovely. People report a new quality of softness, a delicate gentleness that “feels like the touch of and angel,” as one customer put it. We wanted to see what that angel’s touch would do to Anandalite. And we were not disappointed. Robert Simmons writes: “Angel Aura Anandalite aids in one’s attunement to beauty, and it can assist one in remembering to pay attention to the beauty surrounding one, in both Nature and Spirit. Wearing Angel Aura will assist one in being a beacon of inner beauty, peace and spiritual awareness. These stones stimulate the kundalini, for access to higher consciousness, while attuning one’s expanded awareness to the angelic vibrational spectrum. “Meditating with these stones, one can easily move beyond the body and go to one’s ‘inner temple.’ This is a place of purification and rest, in which one’s angelic guides are present, ready to help one release stress and move into deep peace. Because of the highly energetic nature of Angel Aura Anandalite, the immersion in the angelic frequencies can facilitate rapid transformational healing of all levels. The healing emanated by Angel Aura Anandalite works from the most rarified subtle body levels all the way down into the density of one’s physical form. I highly recommend these stones for practitioners to use in healing layouts, and for individuals to work with in their own layouts and grids. The rare combination of intense power with angelic gentleness makes these stones uniquely helpful for spiritual awakening and self-healing. I recommend, if possible, making a grid of twelve of these hearts around the body, with two others placed on the body, one on the third eye and another over the heart chakra. If one cannot afford twelve, a grid of six will still work quite well, and even just the two stones on the body can beneficially affect one’s entire energy system. We’ve recently designed a new group of Power Wands, using polished Selenite points as the base and amplifying their energy with pieces of the powerful new crystal called Magnifier Quartz. We have long worked with Selenite to stimulate, synergize, unify and expand the energies of multiple stones constructing in crystal tools. The discovery of Magnifier Quartz adds a new dimension to these tools, enhancing there currents a great deal. On our winter buying trip, we also got the chance to hand-pick a batch of A++ Lemurian Light Crystals. These are water-clear, perfectly formed Lemurians, mostly finger-sized, and amazingly powerful. We spent an entire day choosing our 10 kilos of crystals from a 200-kilo barrel. The miners had been extraordinarily careful, wrapping each crystal individually to preserve its surface from chips or scratches. Then we high-graded the best of the best from their stock, so we could offer something truly lovely to our readers. “Being ‘turned on’ can mean being filled with Light, and these crystals do precipitate the experience of pleasurable inner Light. The Light I could see was totally woven into the waves of peace and inner silence engendered by the stones. “As I worked with the Lemurian Light Crystals, I experienced some visions. Among them were impressions of scenes from a past civilization that I presumed was Lemurian. However the people in the scenes I saw were very powerful and dynamic, different from the soft, dreamy Lemurians I had envisioned before. I seemed to be shown that the beings revealed through these crystals were from the ‘Capital Island’ of ancient Lemuria, and they were the elite of their kind. They seemed to be utilizing crystals like the ones I was holding, as aids to focusing consciousness for practices such as healing and clairvoyance, and in other activities I could not understand. I believe these stones may carry memories of some of these lost capacities, and they can teach those who are willing to work with them to recall and embody them. “Here and now, I can say that Lemurian Light Crystals are deeply soothing and quieting to one’s consciousness, even as they awaken the inner Light. They can help one enter quickly and deeply into meditative states, releasing stress and opening the mind to receive inner guidance and inspiration. Further, they can help one to become more coherent, in the sensed of enhancing the organization of one’s Liquid Crystal Body Matrix. As I have written in Stones of the New Consciousness, increased crystalline coherence in the body seems to enhance one’s capacities for all sorts of expanded awareness. Once again, I want to point out that the crystals bring pleasure into the brain/mind. We are not used to thinking of pleasure as a sign of enhanced consciousness, but this is probably due to our Puritan cultural past. When we are functioning at our highest levels of awareness, pleasure is always present. “In certain important ways, Lemurian Light crystals embody the same qualities as the traditional Lemurians. As I wrote about them in The Book of Stones: ‘With these stones, there can be wonderful experiences of heart opening and the healing of the emotional body. One may feel the elation of the ‘return to paradise,’ the reconnection with soul, the sense of becoming more whole. The Lemurian Light Crystals can also open us to enhanced and rewarding sensing capacities. Their focus is more on the illumination of the mind and the integration of the brain hemispheres than is the case with Lemurian Seeds, but with both crystals one experiences that wonderful feeling of the return of lost or dormant capacities, and the pleasure of feeling more whole. We were with a friend in the crystal business shortly after he rediscovered an entire barrel of old Lemurian Seed Crystals, from the original mine in Brazil. Like the story above with the Colombian crystals, we were present at the right time to high-grade the available stock and take home the best. There is always a shortage of good Lemurians, so we bought ninety pounds of these fine finger-size crystals. “Of course, one is meant to do more than take a permanent vacation from life as one has known it. The Lemurian Seeds can help one attain once again that balancing, nurturing, loving, spiritual and sensuous consciousness that has been long lost by much of humanity, but one ought not to abandon the rational, mental world when one does so. One must integrate both types of consciousness together and transcend both emotional Lemuria and technological Atlantis. “Still, the response to these crystals is often so charged with feeling and so laden with love that one feels them as a balm to the soul. Lemurian Seeds can benefit just about everyone. Most people need the heart opening and emotional/spiritual healing they offer. And even if one doesn’t ‘need’ healing, the feeling they offer is simply delicious, which is reason enough. Healers can use these crystals to bring such experiences to their clients. “Lemurian Seed Crystals emanate a decidedly yin, or feminine, energy. They harmonize wonderfully with stones such as Gem Silica, Larimar, Celestite, Azeztulite, Satyaloka Quartz, Petalite, Morganite, Rose Quartz and Kunzite. Moldavite can catalyze their activation to the highest spiritual level. To bring in the counterbalance of the more Atlantean energies, I suggest Herkimer Diamonds, Siberian Blue Quartz or any stone cut into the forms of the Platonic Solids and/or the Merkabah. Nirvana Quartz is the name given to a group of growth-interference Quartz crystals discovered in 2006 in the high Himalaya mountains of India. 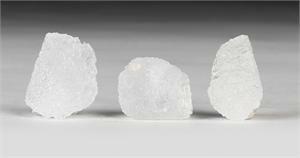 Like other Quartz, they are silicon dioxide crystals with a hexagonal crystal system and a hardness of 7. We purchased our stock of Nirvana Quartz five years ago, when they had first been discovered. As is often the case with a new find, the best stones came out first, and we find ourselves with better specimens than any we have seen available for some time. And we have even put them on sale! We invite our readers to experience these amazing stones for yourselves! 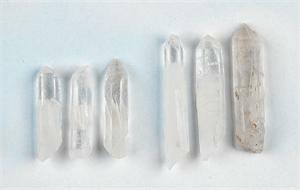 Robert Simmons writes: “Nirvana Quartz crystals resonate at the intersection of past and future time. They have apparently existed in quiet isolation beneath glacial ice for many thousands of years, almost as if waiting for this moment to appear in the human world. Though they carry the current of the deep, silent past, their mission is to attune us to the not-yet-formed potential of what can be. The spiritual beings which express as these complex, almost unearthly crystals, are available to aid us in the evolutionary transmutation which is our highest destiny––the incarnation of enlightenment here and now, in our bodies and on the Earth. “Meditation with these stones is first an immersion in deep peace and interior silence. The inner dialog of thoughts is stilled with much greater ease than is usual. It is as if a gentle hand moves inside the skull, and the small, talkative self of ego goes quiet in awe of the touch of such a being. For the gentleness of Nirvana Quartz is paired with a current of strength that even those who are normally not crystal-sensitive can feel. If one allows the unfolding to continue, visions often come—waking dreams that picture what one most needs to see in order to consciously choose the path of one’s highest destiny. “Another way of describing the effects of Nirvana Quartz, or another aspect of them, concerns the integral linking of the brain/mind with the heart. The clear/white Nirvana Quartz crystals tend to stimulate and awaken the third eye and crown chakras, while the pink crystals are felt deeply in the heart. Yet the currents of both types of Nirvana Quartz can flow through the entire passage between the head and heart. “In fact, one of the most significant applications of these stones is to use two together to stimulate both areas in synchronous unison, initiating a beneficial feedback loop in which the mind sends love and appreciation to the heart, which responds with upwellings of joy, which inspires more powerful waves of appreciation, intensified resonances of joy, and so on. The awakening of one’s deep, natural brain-heart circuitry of positive feedback and well being is why the stones have earned the name Nirvana Quartz. The transcendent peace they embody, from their past centuries under the ice and their future potential as allies for our evolution, reverberates throughout one’s physical, soul and spirit bodies. “Ideally, working with Nirvana Quartz in the way described above entails the use of one pink and one white crystal. One can begin by holding the pink stone at the heart and the white one at the third eye or crown—the natural ‘home’ of each. Then, as one feels the currents flowing, one can follow inner sensing to reverse the positions of the crystals, and/or to use both at the head, heart, or other areas. One is advised to follow the tiny urgings one feels, especially those arising from the heart, in these processes. “Perhaps the most revolutionary application of Nirvana Quartz involves setting up the blueprint of post-human destiny. To be post-human means to be beyond the historic human limitations of fear, doubt and violence—living and creating each moment through utter, ongoing, trusting engagement with the not-yet, the fertile unknown which is the future. The beings expressing through these stones can be viewed as the angels of our potential, or as our future selves calling us into what we can be. To enact such a patternless pattern is to be fully willing to live in paradox, to create and release in each moment, and to sing the joy of existence back to the Supreme Divine. This singing salutation of joy must reverberate from our minds, our hearts, souls and spirits, all the way through to our cells, down to the core of every atom of our being, with not one grain held back. And it must pour forth from us as a gesture into the unknown future, giving ourselves forward in constant sacrifice (making sacred), in pre-manifest gratitude for we know not what. If human cultures have ever done this, it has been long forgotten. Yet it is the lure of our becoming. “The pink Nirvana Quartz crystals are associated primarily with the feminine stream, and the white with the masculine. Yet these terms are limited and should not be allowed to limit the possibilities of what can emerge through working with these stones. Similarly, though the white crystals resonate easily with the 6th and seventh chakras, while the pink ones flow with the heart, one can encourage and allow these to flow through all levels of oneself, as they do in their most full-blown expression. In our show in Tucson, we sold a number of Golden Azeztulite Crystals, and many strands of our Golden Azeztulite beads. We introduced these beautiful and powerful Azeztulites several years ago, and we felt it was time to call attention to them once again. These stones are rare, even among Azeztulites, and those attracted to them are advised to acquiring the ones you want as soon as possible, because we have not been able to find any more since their initial discovery in North Carolina. 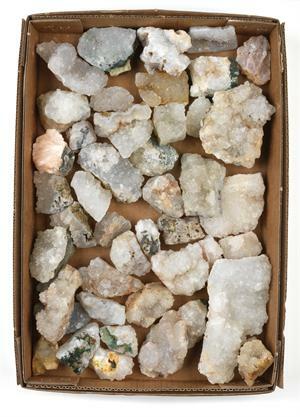 Robert Simmons writes: “The only actual prismatically crystallized Azeztulites, except for a few tiny clusters from Vermont, are the Golden Azeztulite crystals from North Carolina. Although they span the range from milky white to smoky brown, with various shades of golden citrine color in between, we call them all Golden Azeztulite, because they engender within one’s awareness a ray of gold-white light—the ray of the Great Central Sun. All Azeztulite is attuned to this source, but these crystals are the most powerful catalysts for awakening a consciousness imbued with the gold-white light. “As I meditated with three of these crystals, I first experienced Azeztulite’s characteristic and very powerful opening of the third eye and crown chakras simply by holding the Golden Azeztulite Crystals. Placing them at the crown and third eye areas created a highly charged conduit of vibration between the third eye and crown. I experienced those chakras being linked by an L-shaped bar of light which was so strong and intense that it felt nearly solid. “Golden Azeztulite crystals are important in their stimulation and awakening of the Light Body. The currents that vibrated through my body as I worked in meditation with Golden Azeztulite gave rise to the sense that my entire Body of Light was awake, all at once, and perhaps for the first time. There was a sensation of having another body overlaid upon the physical body. The felt sense was that the awakened Light Body, unaccustomed to awareness of itself, was suddenly present and overlapping (though not completely woven into) my physical form. This was my most vivid awareness of the Light Body, and yet I sensed it was only the beginning of what we will experience as we proceed down this path of our evolution and destiny. I feel we have the potential to become fully spiritual human beings, wearing the garment of Light. “The currents of the Golden Azeztulite Crystals continued to course through me very powerfully, and the L-shaped flow of energy pouring though the third eye and crown chakras became a great torrent. Because of this I opened my eyes, and I saw that the room itself was filled with golden light. This is always an astonishing occurrence. It was unmistakable that the atmosphere had become golden. I have been in this situation two or three other times in group settings after meditation, usually with some form of Azeztulite. This atmosphere of gold was spoken of by Sri Aurobindo’s partner, the Mother. Her project, which I think of as encompassing (though not limited to) Light Body awakening, aimed to engender a kind of human transmutation into immortality. (Many esoteric teachings say that the Light Body is an immortal body.) In her explorations, the Mother sometimes entered a realm she described as an atmosphere of “warm gold dust.” This is precisely what I saw upon opening my eyes after feeling the Golden Azeztulite current move through my skull. The Great Central Sun, from my past meditative experiences, apparently emanates this same gold-white light. A holographic likeness of this same Central Sun is present in our own hearts, and it is sometimes kindled in one’s consciousness in the presence of the Golden Azeztulite, as I experienced moments later. In holding the Golden Azeztulite crystal to my heart chakra, I was quickly immersed in a vision of a golden radiant glow within my chest, where the physical heart is. And this golden glow was filling the interior of my body with gold-white light, while rotating on its axis like a planet or a sun. This vision came moments after I pointed the Golden Azeztulite Crystal toward the heart chakra. “After some time, I tried pointing a small crystal of the Golden Azeztulite at the secondary chakra at the back of the skull, while holding another crystal at the third eye. Once again a powerful circuit was formed, accompanied by a feeling of movement and held tension, as though a curtain were closed over my third eye. I sensed that with the lifting of this curtain could come vivid visual inner experiences, and perhaps the capacity to see truth, and only truth, with clarified spiritual vision. That is my intuitive sense of what Golden Azeztulite is attempting to awaken in us. Such visionary consciousness is among the dormant capacities that this stone can stimulate and bring forward. Another potential that Golden Azeztulite can help awaken is our capacity as time beings—capable of moving in conscious awareness through the fluidity of time. When we are fully attuned to what we are capable of being, I feel that the movement of one’s individual consciousness through time—both past and future—is a strong potential. Another capacity enlivened through working with Golden Azeztulite is empathy. We have empathy now, but the empathy of which I speak is the ability to move one’s self-sense into union with the self-sense of another. In this, one knows precisely how the other person feels and what his or her concerns are. More significantly, one may be able to feel the patterns of the other person more deeply and clearly than she or he is consciously capable of doing. For years Satyaloka Azeztulite from South India has been one of our most treasured high-vibration stones. It stimulates the crown and Soul Star chakras, filling them with pure White Light. It emanates what is probably the highest vibration of all the Azeztulites, (although each type has its own special qualities). Since we first encountered the stones through a devotee from the ashram near the stones’ location, we have only known it to occur in chunks or river-tumbled pieces, with the exception of a small number of very tiny crystals. 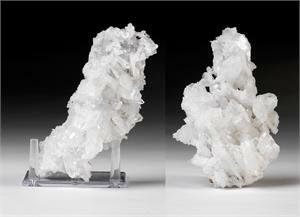 A mineral explorer friend in India recently returned with a small cache of larger Satyaloka Azeztulite crystals. These grew in very interesting, finely detailed shapes, and are from one to three inches long, and they are exceptionally powerful. Robert Simmons writes: “These new Satyaloka Azeztulites are wonderful Light tools! They powerfully stimulate the third eye, crown and Soul Star chakras, emanating a beam of intense current through their terminations. The growth of these Satyaloka points lends them a focus and intensity that is quite remarkable. These are stones of a highly enlightened energy, and they invite us to work with them and awaken to the ecstatic state of full awareness. “Satyaloka Azeztulite opens the crown chakra with a tremendous flow of energy. When I worked with this stone, I felt it pouring downward through the crown as soon as I held it in my hands. The crown chakra opened and a pulsing energy cascade thrust down again and again through the top of my head all the way to my heart. As it extended further, it seemed to be exploring or slowly penetrating the column of my chakras below the heart, with each pulse reaching a little deeper. “Satyaloka Azeztulite placed upon the heart in a pouch produced a deep sense of reverence, an appreciation of the presence of the Holy in the heart. It became difficult to speak or form words as I allowed this vibration of the Holy to move into my heart center. This stone carries deep currents of what I would term the Holy Silence. It has a direct resonance with the vastness of consciousness at the site of Origin. It opens a stream via which one may venture toward the Source. It is a rather magnetic feeling, as the Source draws one toward itself. As one gets closer and closer to it, words are left behind, and as one approaches nearer, one is conscious only of the swirling White Light that whirls around the center void in a spiraling cloud. “Satyaloka Azeztulite is tremendously powerful. Throughout the entire mineral kingdom I know no currents more intense than these. It organizes and re-centers brain activity. It brings consciousness to a deepening sense of quiet and gives a heightened sensitivity to subtle energies and streams of consciousness. It asks a great deal of the heart, for it pulls Light through the heart and into the rest of the body. It is not a difficult or painful thing at all; it is a lovely feeling. It is simply powerful. “Satyaloka Azeztulite is resonant with the energies described in India’s mystical traditions as sat-chit-ananda. Sat means truth, chit is consciousness and ananda is bliss, so this sat-chit-ananda is the quality of truth, consciousness and bliss as one whole pattern. Satyaloka Azeztulite can infuse the Liquid Crystal Body Matrix with the intense high frequencies of sat-chit-ananda. There is, I can only say, a tremendous Light in these stones. 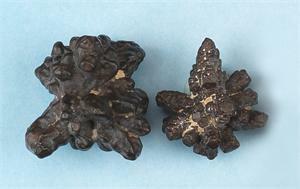 “Satyaloka Azeztulite is a stone of powerful spiritual dedication. It can guide in purification of one’s energy bodies, of one’s intention, will, even of one’s love activities and energies. It encourages one-pointed focus of consciousness through the will in the third chakra. This is an extremely powerful capacity, because one-pointed focus through the will is the most powerful inner “posture” for specific co-creating activity and manifestation of what one envisions. “Satyaloka Azeztulite can be used to travel through the realms of Light to many higher planes of reality. It can be ridden all the way to the archetypal first emanations from Source. It is a powerful stone for conducting one on conscious journeys into the spiritual worlds via the geometries of Light. It enables one to more readily place the Light geometries along and within the body/temple. Satyaloka Azeztulite encourages us to envision ourselves and our world as temples, as holy places. Its adherence to the purpose of Light in the world is absolute, and it engenders absolute devotion to Spirit in the individual. Satyaloka Yellow Azeztulite is one of two highly energetic stones from the Satyaloka region of South India which we introduced last year, and it has been highly praised by our readers. We now have polished shapes, hearts, spheres, beads and jewelry available, and we feel certain that the stone will now become even more popular, as more people experience its energies. Robert Simmons writes: “For the past nineteen years, I have worked with the extraordinary stones called Azeztulite, and I have watch their popularity grow and their varieties increase. Both of these phenomena were predicted in the original channelings that presaged the discovery of Azeztulite. Quartz materials that carry the Azeztulite vibration have been found in North Carolina, Vermont, Colorado, India and New Zealand. 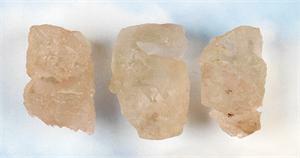 Among the most powerful types of Azeztulite is Satyaloka Clear Azeztulite, found in South India in the same region where the Satya Loka monastery is located. Until recently, this stone was known simply as Satyaloka Azeztulite, but we now have two new members of the Azeztulite tribe––Satyaloka Yellow Azeztulite and Satyaloka Rose Azeztulite. These are both found in the same digging area in South India, in the Satyaloka region. 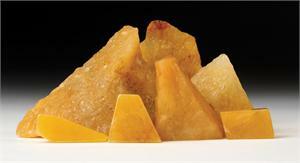 “Satyaloka Yellow Azeztulite powerfully stimulates the Third Eye chakra. Its currents move very deep into the brain, bringing intense and pleasurable sensations. It can also feel as though it is ‘pulling’ one’s consciousness––and even one’s etheric body––upwards! The power of Satyaloka Yellow Azeztulite is the power of evolutionary change. It is programmed for the awakening of humanity and the Earth to a higher level of spiritual awareness, and its energy of awakening carries extraordinary force. Satyaloka Yellow Azeztulites carry the currents of enlightenment (literally: ‘being filled with Light’). They have a strong enthusiasm––almost impatience––for one to wake up and assume one’s spiritual power. They seem to have a will of their own, focused on the rapid acceleration of our spiritual awakening. It is rather thrilling to be around them! “Satyaloka Yellow Azeztulite also stimulates our own will forces, helping one to align one’s intention with Divine will. It strengthens one’s capacity to focus all of one’s energies to serve that intention. In practice, this means one can utterly give oneself over to one’s spiritual purpose, and one can DO that which one wills to do, without doubt or inner turmoil. These stones provide clarity and enhance purpose, as well as awakening the mind to perceive and embrace one’s Divine destiny. When we introduced Satyaloka Rose Azeztulite last year, it was immediately highly popular. Since then, people have been contacting us to share their stories of spiritual opening with these beautiful and powerful stones. We have recently received a shipment from our stone cutters, so we can now offer beads, polished shapes, jewelry, wands and spheres. We’re eager to see what occurs as more people experience the heart-awakening currents of these powerful stones. Robert Simmons writes: “Deeper in the same mining site where Satyaloka Yellow Azeztulite was found, our prospector friend unearthed the rich russet-colored Satyaloka Rose Azeztulite. The reason for the name Satyaloka Rose has as much to do with the stones’ resonance with the heart as it does their peach to salmon-pink color. “When I began meditating with a piece of Satyaloka Rose Azeztulite, I tried touching it to the third eye chakra, as I had with the yellow one. A bit surprisingly, I did not feel much there. The two stones were from the same site, but their very different colors apparently corresponded to a very different vibrational pattern. After a few minutes, I moved the stone to the heart, where it ‘wanted’ to go. “Within a few seconds, I could feel soft yet powerful currents moving into my heart, and almost immediately, they rose upward, filling my entire head with sweet, strong currents which rose upwards from the heart. The emotional tone was loving and peaceful, and at the same time the currents were so strong that my head felt ‘full,’ and it seemed to be expanding. Yet these were not the typical currents I associated with the third eye and crown. They were heart energies in my head! Then I inwardly saw a salmon-colored rose floating in front of me. “This is when the name ‘Satyaloka Rose Azeztulite’ came into my mind. The heart is often symbolized by the rose, and both are deeply associated with love. That is what I was being shown. The currents of this new stone were profoundly loving, and at the same time there was an energy of opening about them. The filled my head with the heart’s feeling, and its expansiveness as well. “I then tried holding both stones at once. I placed the yellow one at the third eye and the pink one over my heart. Using the two together, I felt a great circulation of currents between the heart and the third eye and crown chakras. This time the flow was in both directions. I was aware of feeling greatly expanded, while at the same time my heart and my head were energetically ‘feeding’ each other. “Satyaloka Rose Azeztulite carries the currents of Heart Ascension. Like all the Satyaloka Azeztulites, its vibrations are intense and powerful. These stones not only stimulate the heart chakra, they also encourage the heart to ‘move’ upward into the head. They awaken the Divine ‘I’ of the heart and lift it to its rightful throne in the center of the brain. When this occurs, one thinks, speaks and acts out of the heart’s wisdom. The mind and brain then take their places as the servants of the heart. When this transformation is fully realized, one can speak and act only in truth, because the heart knows only truth. This shift affects the body as well, dissolving all falsehood and self-negation in the mind of the cells. The cells vibrate with the heart’s love and truth aligning themselves with the Light and Love emanated by the Great Central Sun and the Ascended Heart. Satyaloka Rose Azeztulite fully activates the heart’s spiritual Light. “To bring forth the fullness of this profound transformation, combining Satyaloka Rose Azeztulite with Satyaloka Yellow Azeztulite is advised. Using the Rose Azeztulite at the heart and the Yellow Azeztulite at the third eye, the circuit of Light and Heart Ascension can be created and energized. To extend the activation to the crown, place a pice of Satyaloka Clear Azeztulite there. This stone also resonates with all of the Ascension and Synergy Stones. Astaraline assists it in the process of Light Body activation. Violet Flame Opal is the name given to a new variety of purple and white Opal, recently discovered in Mexico. It displays amazing and beautiful patterns of white with purple, ranging from pale lilac to Tanzanite blue. Robert Simmons writes: “Violet Flame Opal has a softening energy. It soothes the emotional body and brings a state of inner tranquility to the Liquid Crystal Body Matrix. Its currents exert a gentle influence of healing to the stresses that can linger in the cells and organs, allowing the body’s inner wisdom to prevail. This stone, like other Opals, operates first and foremost at the level of the emotional body, and is its effect is to spiritualize the emotions, transmuting them to higher forms of feeling. It can aid, for example, in transforming jealousy to generosity, fear to courage, or anger to love. “Violet Flame Opal stimulates spiritual awareness. It links one to the planes of angelic communication, aiding one in connecting with guardian angels and helping spirits. It helps one activate and focus awareness at the crown chakra, as well as the third eye, aiding in the initiation of visionary experience. “Perhaps the most significant quality of Violet Flame Opal is its capacity to cleanse and purify the etheric body and the cellular energy matrix. Its vibrations bring deep harmony to these areas, and they dissolve any negative attachments or inner constrictions. They ‘smooth out’ the wave forms of the emotional, etheric and mental bodies, instilling a harmonious accord among them. “In meditation, Violet Flame Opal has the capacity to call down the Violet Flame of spiritual fire which has been used for many decades by spiritual groups whose purpose was to bring about the birth of the new Spiritual Human. When one meditates with Violet Flame Opal for this purpose, one is advised to first allow inner attunement with the stones’ vibrational pattern, and then to call inwardly for the descent of the Violet Flame. This will often be felt as an intense tingling at the crown chakra, which gradually permeates the body. (Sauralite Azeztulite with Amethyst is the ideal stone to choose to increase the power of this process.) As one continues, it is good to inwardly ‘toss in’ whatever negative or dysfunctional patterns one wishes to burn away. These can be any sort of bad habits, fearful or angry thoughts, or unhelpful indulgences. When the Violet Flame is present, these can be brought to its purifying fire for successful transformation. On a recent buying trip, we discovered a small cache of tiny double-terminated Amethyst crystals from Madagascar. Their size, structure, transparency and energies reminded us of Herkimer Quartz “Diamonds.” Of course, these Amethyst crystals are not true Herkimers, because they are not from the Herkimer mining sites, but they do emanate currents of great intensity, just like their clear Quartz cousins from Herkimer, New York. These are composed of layers of Amethyst as well as highly transparent clear Quartz, so they fit the pattern of purple-and-white purification stones we are suddenly seeing come forward. 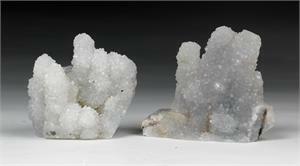 Robert Simmons writes: “I was amazed at the power emanating from these little crystals! When held to the third eye, their currents feel as strong as Phenacite’s. They stimulate both the third eye and crown chakras with an intensity much greater than I have felt from Herkimer Quartz ‘Diamonds.’ Those interested in awakening latent capacities of inner vision and psychic awareness are strongly advise to try working with one or more of these stones. “When worn in jewelry, Amethyst ‘Herkimers’ penetrate the whole auric field with intense purifying and activating currents. They bring one into instant alignment with one’s higher awareness and they dispel all types of impurities from the auric field. They fill one’s field with spiritual Light and they remind the conscious self of one’s Divine Connection. 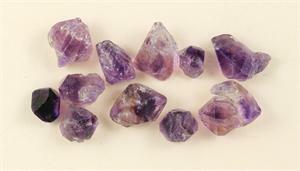 “Amethyst ‘Herkimers’ are amazing stones for dream work. When placed in the pillowcase or (especially) when taped to the third eye, they open the inner visioning capacities and allow one’s dream body access to high spiritual realms. They link one to one’s angel guides, who may appear in dreams and take one on a journey to the realms of Light. They can assist one in contacting spirits of loved ones who have passed over, including pets. This can be done in the dream state or in meditation. “Amethyst ‘Herkimers’ can aid one recalling past lives, especially those in which one will benefit from learning their lessons. In bringing forward such visions, the purifying qualities of these stones can assist in dispelling attachments that might hold one back in current or future lives. “Amethyst ‘Herkimers’ are stones of rapid spiritual evolution. As vision crystals, they aid one in seeing the way the optimal future can be; and as purification stones, they can help one stay ‘on the Path,’ so that one does indeed manifest one’s highest visions of what oneself and one’s world can become. One of the most powerful high-vibration stones for the third eye, crown chakra and etheric chakras above the head is the humble-looking little charcoal-colored crystals called Brookite. These tiny squarish stones pack a lot of energetic power, which can aid one in opening one’s upper chakras and awakening to higher realms. We had been unable to buy Brookite for several years, and were pleased during our recent buying trip to find a miner who had some we could purchase. “When used at the third eye in meditation, Brookite can produce a deep, pulsating, rhythmic vibration that moves from the front of the forehead into the interior of the head and up through the crown. One may feel the physical eyes cross and turn toward the third eye (a desired goal of certain types of meditation), creating a triangular flow of energy which seems to move up and out of the crown chakra. Allowing the process to continue, one may expand into consciousness of the various levels of the etheric, astral and causal bodies. Often one will feel the benevolent presence of spirit guides and angels encouraging and assisting this process of expansion. Removing the stones from the third eye, one may feel a slow ‘gathering in’ of one’s energies as they return to the normal state. Yet such normalcy still retains the connection which has been established with the higher domains. “Brookite enables one to reach an expanded state in which one can communicate and commune with beings on the higher vibrational levels. It teaches one the nature of the higher levels of consciousness vibration. It can help one gain the ‘cosmic perspective’ that allows one to see even unpleasant situations as beneficial to growth. It is inspirational and energizing, assisting one in overcoming old patterns and moving ahead to greater inner development. We first encountered Anandalite two years ago, and we were astonished by the experiences it engendered in ourselves and others. It has the capacity to awaken kundalini energies in a way that is both powerful and safe. The safe and balanced activation of kundalini in large numbers of people is something we view as an essential element of the world-awakening into which we are moving, at an ever-quickening pace. Gopi Krishna, the most accomplished and well-known kundalini adept of our time, has called kundalini the “energy of genius” in humanity and states that kundalini awakening is central to the evolution of human consciousness. Kundalini awakening can precipitate ecstatic states of consciousness, and can trigger inner openings into divine awareness. Synchronistically, at the time when widespread kundalini awakening is most needed, the stone that can catalyze such awakening has appeared. Since we introduced it in 2010, Anandalite has been experienced by hundreds of people in our showrooms, and in Robert Simmons’ recent Stones of the New Consciousness Intensive. In observing the experiences they reported, we have discerned certain patterns that confirm the connection of Anandalite to kundalini. For purposes of demonstrating the currents of Anandalite to friends and customers, we often ask the person to stand in profile while one of us uses two Anandalite stones, one in front and one in back, to bring the latent kundalini energies up the spinal column. (Kundalini has been metaphorically described as a “serpent” curled asleep at the base of the spine. When kundalini awakening begins, the serpent of energy moves up the spine, activating all the chakras and ultimately opening the “thousand petaled lotus” at the crown.) Most people we worked with reported a rising energy beginning at the root chakra as warmth, intensifying as it rises. At the heart, the warmth frequently changes to emotional energy, which is most frequently experienced as joy. At the third eye and crown, the energy often transforms into white Light or into an inner rainbow display of multicolored Light. Although not everyone begins by experiencing all of this, most people have a strong sense of the rising energy. Most interestingly, a large number of them involuntarily sway in an undulating motion as the stones move up in front and in back of the spine. This is an enactment of the kundalini “serpent” rising from the base chakra, and the undulations that involuntarily occur show why the energy is called the “serpent fire.” When this practice was done by 150 people at the Stones of the New Consciousness Intensive, there were scores of people swaying like this, all over the room, and the room itself was filled with powerful currents. It is our feeling that we have just begun to tap into the potentials of working with Anandalite. The above set experiences echoes everything reported by people working with the energies of Anandalite, and convinced us that the hypothesis that Anandalite can activate kundalini is correct. The degree of activation depends on many factors having to do with the individual, but the way the energy works seems clear. In the book on kundalini, one of the chief issues addressed was the unpredictability of kundalini awakening and the need to find dependable pathways into the experience. We believe that Anandalite (which synchronistically comes from India, where kundalini has been known and cultivated for millennia) may provide an essential key to this awakening. Anandalite Activation Pair: To stimulate the chakra column and begin the activation process, we use a pair of Anandalites––one in front and one in back, as shown in the photos. Although one can use any two pieces of Anandalite, we have found it most effective to use one elongated stalactite-shaped piece and one plate-shaped piece. Usually we use the stalactite in front of the subject and the plate in back. Something about this combination seems to accommodate itself best to the energy field. We have found that all sizes work, but that larger pieces generally emanate a more powerful flow. Anandalite Chakra Sets: One way to enhance the effects is to set up a body layout with a piece of Anandalite at each chakra. This helps draw the kundalini energy up, activating each chakra point, and the presence of the stone helps stabilize each chakra at a higher vibrational level. We like to use one stone for each of the seven physical chakras, with an additional stone at the Soul Star chakra (about six to nine inches above the head) and another at the Earth Star chakra (about six to nine inches below the feet). Thus, our full chakra sets consist of nine Anandalites. Anandalite Environments: We have gone even further with our environmental use of Anandalites. In addition to the grids and body layouts, we find that placing Anandalites around one’s home or work environment can raise the energy levels wherever one happens to be, helping one learn to function at all times at a new higher vibrational level. For those interested in Anandalites for the environment, or in gridding one’s whole house or land, we recommend purchasing Anandalite by the flat. Our Commitment to Anandalite: We became so convinced that Anandalite is one of the premier stones for the evolutionary quickening and awakening of humanity that we sought out the source of the stones in India and purchased as much as we could acquire––an amount of over three tons! We were primarily interested in the energies of Anandalite, aside from its value as a gemstone, so we made our highest priority to get a large quantity of the stones at a reasonable price. Readers will see that many prices on our Anandalite pages are much lower than in previous catalogs. Originally we purchased only the rare and colorful (and more expensive) Rainbow Anandalite, which we still offer. But now our focus is on bringing these stones to as many people as possible, so we are offering these powerful stones at a fraction of their original cost. Anandalite by the Flat: For those who want a significant quantity of Anandalite at the lowest possible price, we recommend buying Anandalite by the flat. The flats are shallow cardboard boxes/trays that hold from seven to twelve pounds of assorted size Anandalites. Shapes, colors and sizes vary greatly, but the energies are in every piece! As a final note, we print here Robert Simmons’ initial reactions to Anandalite: “In my own process of working with Anandalite, I recorded these observations: Anandalite is among the most powerful stones for Light Body activation and awakening the dormant potentials of both one’s physical body and one’s consciousness. It profoundly stimulates the central nervous system, all along the spinal column from the root chakra up to the crown. Its currents wash through the whole body, like a tsunami of intense, pleasurable, subtle electricity. Sometimes it focuses in the lower chakras as a warmth, which can increase in magnitude until one actually sweats from the heat. (I also observed this among some volunteers at our shows and Intensives). “As one invites the currents to rise, both through movement of the stones and through inner intention, one can feel the flood of vibration and warmth entering each chakra. This rising tide is greeted with delight by the body, both in the areas of the chakras, and throughout the Liquid Crystal Body Matrix. As the currents enter the higher chakras, where there is more refined consciousness, the stimulation becomes less physical and more spiritual. At the heart, the heat turns to an upwelling of love and joy, and a rush of imagery (often of colored lights, though sometimes of beautiful scenes, or of people one loves) appears in rapid succession. It feels as if the heart is offering its joy upward to the brain. “At the throat, there is at first a feeling of fullness, like a ‘lump in the throat,’ which clears as more of the vibration enters. My sense is that the stone currents are cleansing this area of blockages, and this is confirmed by the subsequent feeling of well being in that area. Our Fall buying trip yield one small group of specimens we had never seen before––Pink Datolite crystals from Mexico. Previously all of our Datolites had been green or greenish gray, and had originated in Russia. Also the new Pink Datolite specimens have attached cubes of gold-white Calcite, blending their energies are in unique ways. They feel quite wonderful, and we’re sure that those who are called to them will be rewarded by their experience of these rare stones. Robert Simmons writes of Datolite: “Datolites are strong crystals for the third-eye, crown and etheric chakras. They open one’s subtle vision, allowing one to see auras, as well as beings in the astral, causal and subtle domains. Nature spirits, angels, guides, non-physical teachers, healers and helpers all become visible and available for communication. The fast-pulsing energies of Datolite increase the vibration of one’s energy field so one can consciously experience one’s own spiritual body, using it to explore the many higher dimensions surrounding us. “Yellow-green Datolite in particular can be used to enhance the heart and solar-plexus chakras and their links with the etheric chakras. In order to truly evolve, one must develop the high heart and the high will, the exalted aspects of the fourth and third chakras. Yellow-green Datolite assists in this process, because its vibrational pattern exhibits this exact dynamic in finished form. Being near this type of Datolite, one can develop an energy resonance with it that moves one’s own pattern into this ideal spectrum. Continuing on with his impressions of the new Pink Datolites, Robert writes: “The Pink Datolites from Mexico are just as powerful for stimulating interdimensional awareness as are the Russian varieties, and they have added capacities. They are ideal for establishing a center of self-awareness in the heart, and for opening that heart-centered self to an awakened state of communion with numerous levels of the higher realms. They link the heart, third eye and crown chakras, stimulating a compassionate, stable ‘seat of consciousness’ via which one may travel through multiple universes and enter the realms thought of as ‘heavenly.’ They can facilitate an inner linking with all of the realms of spiritual Light, and they attune the emotional body to a state of ecstatic bliss. 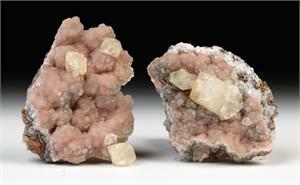 “The golden-white Calcites attached to the Pink Datolites provide their own beneficial currents. They initiate an energetic current linking on to the Gold-White Ray, which is the Light of the Great Central Sun. Thus, these particular specimens work especially well with Azeztulite in regard to one’s cellular embodiment of the Pure Light of the Central Sun. This is of tremendous significance, because this cellular embodiment is what initiates the formation of the Body of Light. Last year, those of us who follow developments in the world of minerals were surprised by the discovery in Africa of Orange Kyanite. Until that time, only Blue, Black and Green Kyanites were known to us. 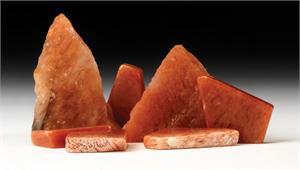 The new Orange Kyanites have turned out to be a delightful addition to our stone selection. “Robert Simmons writes: “The constant call in these times seems to be the call of the body, and the call TO the body. We are urged by the spiritual realms and by the Stone Beings to bring the energies of what we call the higher worlds into manifestation here, through ourselves, our physical forms and our very cells. Orange Kyanite has emerged at this fortunate time to aid in that transformation. These stones are capable of facilitating the transformation of high etheric energies into the liquid crystal of our DNA, aiding us in producing physical evolutionary changes within a single lifetime. This can be something as simple as healing or as earth-shaking as Light Body awakening. The catalytic potential of these stones is awesome. They are among the most powerful aids for manifestation, allowing one to bring one’s inner visions into outer form. This can be true within one’s body as well as in one’s day-to-day life. “There are only a few stones that work well for activating the awesome power of the second chakra, seat of our sexual and creative energies. Orange Kyanite is one of those stones. It stimulates the second chakra, and can clear it of negative energies and/or attachments. This can be of great help if one is working to clear old wounds and blockages on that area, from this life or from past lives. Meditating with one of these stones can help one attune to the incidents in which one’s creative power was interfered with through sexual manipulation or wounding. Seeing the dysfunctional pattern, one can more readily dissolve and release it. When one’s physical, emotional, astral and etheric bodies are cleared at the second chakra, one’s capacity to create can truly blossom. This clearing can also open one sexually in a healthy way, and allows one to explore and enjoy one’s sexuality in joyful and creative ways. “Orange Kyanite also stimulates the first and third chakras, bringing an enhancement of life force and a strengthening of one’s ability to use the will creatively. Meditation is fundamentally the training of attention. When you can hold your attention on something without being derailed by outer distractions or inner wandering, the secrets of whatever one is contemplating will eventually reveal themselves within you. The empowerment and unification of the first three chakras is essential to this process, and the ability to use one’s will to hold and expand one’s attention comes out of that empowerment. This is potentially one of Orange Kyanite’s greatest gifts, because it allows us to enter into co-creation with the Soul of the World. She is always ready to meet us in the creative dance, but we are not equipped to join Her until our attention is under our own command. 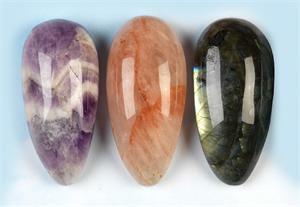 We were excited to acquire these new Gemstone Massage Tools from a supplier in Madagascar. These handcrafted shapes are designed to actually be used in massage work, and they fit comfortably in the hand. They are also very effective in applying both pressure and energy to the body, without causing accidental discomfort to the massage worker or the client. They come in a variety of seven different stones, each with its own characteristic energies and spiritual qualities. The types of stones available in these special tools are Labradorite, Carnelian, Amethyst, Clear Quartz, Rose Quartz, Jasper and Agnitite. 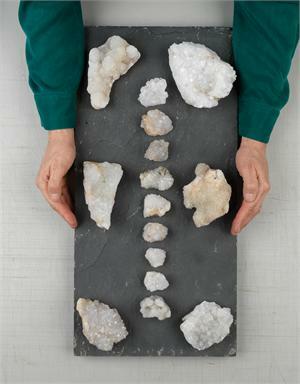 With a whole set of seven, one has a complete energetic tool kit for combine stone energies with bodywork! 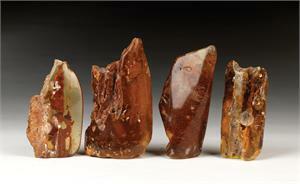 We were most fortunate to acquire more fine Aegirine crystals from South Africa. We were even lucky enough to get a pair of large Aegirine clusters and several individual crystals over four inches long! Aegirine is in high demand for clearing the body of negative vibrations and protecting one from negative influences in the environment. It is one of the premier stones for such applications, and it can also provide instantaneous grounding, without a loss of energy. 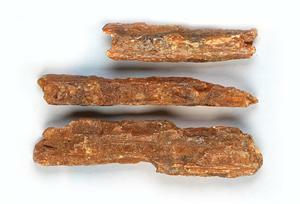 Robert Simmons writes: “Aegirine is excellent for removing negative or stuck energies from all levels of the subtle bodies. It provides a high degree of spiritual protection from negative energies or entities. There are few stones as effective as Aegirine for breaking the attachment of negative entities to one’s etheric body. Such attachments are not normal for energetically healthy and balanced individuals, but anyone can become vulnerable in moments of strong fear or anger. Negative attachments can also take root if one makes holes in the aura’s protective field through abuse of alcohol or drugs, or smoking cigarettes. Carrying or wearing Aegirine can be an effective stop-gap measure for forcing the release of these vampiric energies, and working with Aegirine in body layouts or in conjunction with other subtle energy healing modalities can, in time, regenerate the damaged protective auric shield. “Aegirine presents itself as a stone deeply dedicated to service in healing and purification. It has offered itself in a sacrificial act of willingness to go deep and cleanse all of the worst and most difficult places within us. While many stones resonate best in the heart and upper chakras, Aegirine is willing to enter into the lowest chakras. When I held the Aegirine near my base chakra, I felt a steady pull toward the crystal of every sort of impurity in the places within my energy bodies that corresponded to physical disharmonies in the corporeal body. This stone carries a vibrational charge that is so deeply opposite the negative charges of our disharmonies that they are drawn to Aegirine as inexorably as to a magnet. One can imagine this by visualizing the way something charged with static electricity can pick up bits of paper that will cling to it. In a similar gesture, Aegirine attracts everything in us that is impure. This is indeed a great service to the evolutionary potential of the human being, for in our daily lives in the world there are innumerable possibilities for attaching or being attached to by negative complexes. We are not consciously aware, in most cases, of these attachments, Aegirine, if we invite it to enter our field, will cleanse us energetically, perhaps more deeply than we have ever been cleansed. Aegirine is unafraid of what we may find repugnant and what we therefore may not wish to regard in ourselves. Aegirine is like the diligent worker who does what is needed whether it is agreeable or disagreeable. One of our suppliers in Mexico has just started making some very special pieces from his country’s native Black Obsidian––scrying discs and aura-cleansing wands. The scrying discs are round and flay, about 3.5 inches to 5 inches in diameter and about one half inch thick. The aura-cleansing wands are double-terminated and are about six inches long. Both of them are potent tools for some special kinds of spiritual work. 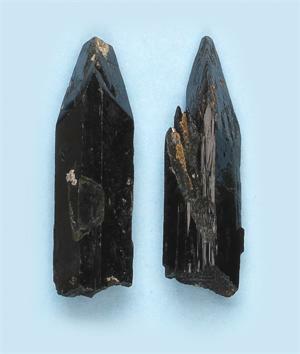 Robert Simmons writes: “Obsidian has long been used in the magical practice of scrying––a kind of divination in which one meditates while looking into a shiny black surface, awaiting spiritual visions. For this purpose, Black Obsidian is highly preferable to glass or any other material, because its energies enhance meditation, provide spiritual protection from negative forces and open portals of vision into other realms. In a scrying meditation one puts out the intention of what one wishes to experience, ranging from receiving psychic information about oneself or a client, to communicating with deceased loved ones, to experiencing prophetic visions of events to come. As one meditates, one gazes into the obsidian ‘mirror’ with diffuse vision, preferably in a somewhat darkened room. 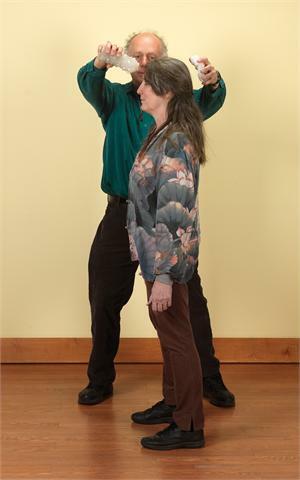 The low sensory input allows subtler energy forms to impress themselves onto one’s perceptions. This sort of tool can powerfully enhance one’s meditative experiences in these areas, and the protection provided by the Obsidian itself is helpful in reassuring oneself that the practice is safe, and in making it so. 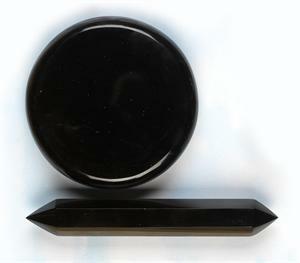 “The new Black Obsidian aura-cleansing wands are simply excellent tools for all sorts of energy work. One can use them before or during meditation to clear one’s field of impurities of negative attachments. One can place them at the root chakra during stone body layouts to provide grounding. They are ideal tools for sweeping through the auric field of clients or friends to clear the energies and dispel any negative patterns. These wants can be used to cleanse other stones and to work magick at a distance to clear the fields of those whom one may be trying to help. Our Fall buying trip yielded some amazing glossy, deep blue Azurite crystals, These were larger than any we had ever been able to buy before, and we are excited to offer them. May people have asked if they could purchase the Azurite crystal on the cover of The Book of Stones, and these are the first comparable specimens we have had available. Although all forms of Azurite have wonderful energies, Azurite crystals are believed to embody the virtues of Azurite in their most concentrated form. “Robert Simmons writes: “No stone is a purer embodiment of the Blue Ray than Azurite. Its rich dark-blue color carries the exact frequency of the third-eye chakra and is a natural tool for the activation of that energy center. Azurite is a stone of inner vision and can be used for the enhancement of dreams as well as the development of psychic powers. It can stimulate intellect as well as intuition, and it is a helpful aid for those who are studying new or challenging subjects. It is recommended that anyone who is a student, including being a ‘student of life,’ carry or wear an Azurite to aid them in the assimilation and retention of new information and ideas. 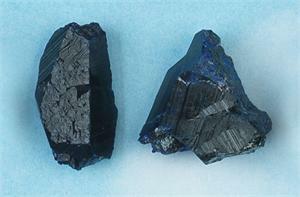 Azurite can also facilitate the agility of mind required to make conceptual leaps and reach new insights. Azurite can be used to strengthen the astral and etheric bodies, making one less vulnerable to psychic attack or attachments. It can be used to seal ‘holes’ in the aura, thus alleviating tendencies to succumb to fatigue. It stimulates all the mind centers, nourishing within the self a keen interest in all aspects of one’s life and function in society. It is an excellent antidote to boredom, since it opens one’s inner eye to a wide array of connections and possibilities. Those engaged in academic pursuits may find that Azurite makes it easier to retain clarity and focus while studying. It can certainly assist one in making new connections between seemingly unrelated fields of knowledge. It is a stone of synthesis, whereby the discovery of new commonalities and links between different ideas leads to higher levels of understanding of life and the world. In our spare time, we’ve been working on all sorts of body layouts and crystal grids. We have found that surrounding the body with a set of six raw Selenite wands and six White Azeztulite raw stones three to five inches in diameter creates a space of pure spiritual Light around the person receiving the stone layout. This creates a sacred space around the person and facilitates a much deeper meditative or healing experience. In fact, just these stones alone create a wonderful and Light-filled meditation space, or a pure and lovely sleeping space, if one places the stones around one’s bed. In order to facilitate people’s experimentation with this sort of energy work, we are offering sets of six raw Selenite wands plus six large Azeztulites at greatly reduced prices. If you are interested in one of these sets, call us at 802-476-4775 or search on our website for Body Layout Grids. We can also provide larger quantities of Azeztulites and Selenites for gridding one’s entire house or property. Call or email Robert for a consultation. Of course, in many ways a Labyrinth is the ultimate crystal grid. 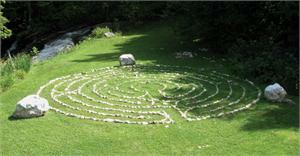 We created a 37 foot labyrinth at our house in Vermont, using a variety of Azeztulites, plus Rosophia stones. The energies generated by placing stones of this vibrational level in such quantities‚ and in the sacred pattern of the labyrinth‚ are astonishing. We walk our Azeztulite and Rosophia Labyrinth almost every day (weather permitting), and it brings us into a state of expanded consciousness and deep peace. At this time, we have sufficient stocks of raw Azeztulites and Rosophia (not gem grade, but highly energetic) to build two or three more labyrinths like ours. The cost of the stones is about $30,000, plus shipping and setup (if desired). If you are drawn to create something like this in your world, contact Robert at 802-476-4775 or heavenandearth@earthlink.net, and we’ll see what can happen. 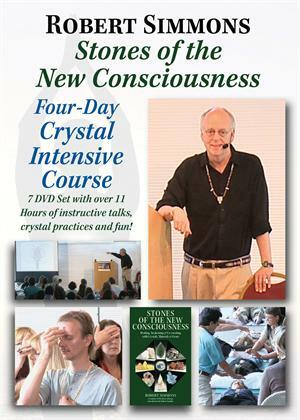 Over the past few months, a number of people who have watched the videos from our Stones of the New Consciousness DVD sets have contacted us to ask whether the stone sets used during the Intensive are available for sale. In response, we have decided to re-create the sets and make them available, so that people watching the DVDs can participate fully in the meditations, body layouts and exercises. The set of over thirty powerful high-vibration stones retailed for an average of $2300 to $2600 per set, and at the Intensive we offered them at the super-reduced price of $900. We have decided to extend that offer to anyone who has purchased the DVD set and wants to work with those stones. This offer is limited to existing supplies, and may be cancelled at any time.